Ralph Lauren, an American-based luxury clothing brand, continues its success in the luxury watchmaking. The latest model offered by the brand is a unique piece with minute repeater function. The new model is offered in an 18K white gold case measuring 42.5mm x 10.1mm. 30 meters water resistant case sports scratch resistant sapphire crystals on both sides and an 18K white gold bezel that is decorated with Guilloché pattern which matches with the dial. The dial of the new model is finished in silver with Guilloché pattern. The indices are designed in Roman numerals where the hands are worked in Breguet style with black finish. The small seconds sub-counter is located at 6 o’clock position of the dial. 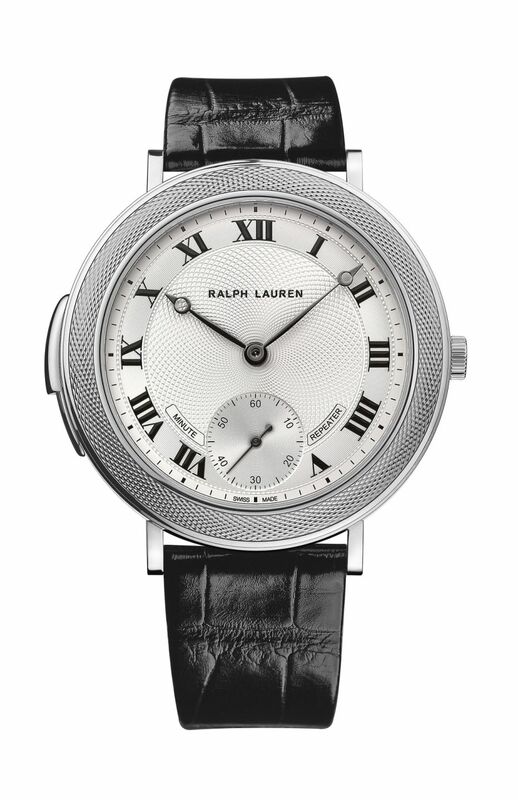 Ralph Lauren Minute Repeater is powered by the brand’s in-house movement Caliber RL888. 37 jewels hand wound movement beats at 3Hz and offers an impressive power reserve of 100 hours when fully wound. The model is offered on a black alligator strap that is secured by an 18K white gold buckle.